Raccord Sniper is an experimental new indie game that comes from the creator of Loop Raccord and UFO On Tape. The game is a cool shooter that lets you play as the Raccord Police. Your goal is to search for weird furniture or other items inside various apartments and to actually shoot them down. The game was developed by Nicolai Troshinsky and is definitely a cool take on the usual shooting game. Although the developer admits he did not intentionally create a series of games based on raccord, so far, he has done three games with the same subject. Raccord Sniper was done entirely from recycled pictures of the IKEA catalogue; definitely a neat little game worth your while. 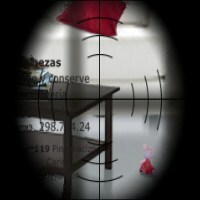 Raccord Sniper sees you eliminating and blasting off suspicious looking items in other people’s apartments. You can only view one apartment at a time though. When you switch to another room, one piece of furniture from the other room will change into something else. This is where the memory puzzle part of the game comes in. You need to have a good memory and remember which item doesn’t belong in the picture. This would be the” shapeshifter,” hence, you need to shoot it. The game really focuses on making sure that you recognize the signs of suspicious furniture, toy or any other item in the apartment. In the end, the gameplay isn’t exactly a breakthrough but it does offer a fun time when you play. As for the graphics, the use of the IKEA photos is quite unique. The concept behind it also deserves much praise. It’s truly a game worth your while.